The following is a guest post from Eric Silver who is the founder of the Pittsburgh based company WebKite. I have crossed paths with Eric a few times over the past couple of years – coincidentally I think I may have first been introduced to him at Bacon Night at the Harris Grill (All good things on this blog related back to bacon night). Over the past few months I have been learning more about WebKite and how to use their tools to build some more great and Pittsburghy features for IheartPGH. You can learn more about WebKite and sign up to create your own kite at webkite.com/beta. Today is also a good day to share this post from Eric because the Post-Gazette published a great article checking in on some of the companies that got their start at the last Pittsburgh StartUp Weekend in October – #ixzz2I9s8WmIu " target="_blank">Less than a year after the first Pittsburgh Startup Weekend, firms make strides. Keep an eye on ThinkTiv, a Pittbsurgh and Austin based venture accelerator, and some of the companies that they are working with. Paul Burke who heads ThinkTiv’s Pittsburgh based office is working hard to help launch more successful companies in the Pittsburgh area. I have participated in both of the Pittsburgh StartUp weekends and it has been an incredible experience to meet a whole new group of Pittsburghers. I am so happy to see that the folks from Thoughtful Husband are still working on their business idea. Another one of the teams from the last Pittsburgh StartUp weekend is MegaBits App – you can learn more about their business idea and support their Kickstarter project here. 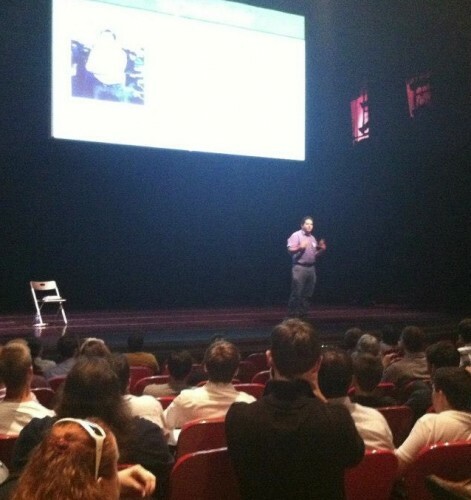 I was fortunate to have the chance to take the stage at Pittsburgh Startup Weekend this year – front and center in front of 140 Pittsburgh entrepreneurs. These entrepreneurs had paid to trade their weekend for a chance to work to build something meaningful. To put this in perspective, this was the second Pittsburgh Startup Weekend and attendance nearly doubled from last year’s 80. While it’s a small sample size, it’s a good indication of the startup culture in Pittsburgh. Pittsburgh, which has done wonders to break free of its rust belt heritage, has reinvented itself to become a livable city, facilitate a biking infrastructure, and most recently a center of innovation. Growing up in Sunnyvale, California, I watched cherry orchards slowly replaced by Apple. I saw technology come to fruition and exceed my wildest expectations. And yet, I chose to grow my startup in Pittsburgh – a city that reminds me of what my hometown looked like as a kid; full of promise, technology, and people ready to take a chance. Why the shift? To start, the Internet has broken down all geographical barriers, but it’s much more than that. Pittsburgh was a city founded on a series of rivers and mountains of coal. The wrinkle of rivers in Pittsburgh created micro-cultures and a city with multiple identities. Because of these resources and opportunities many entrepreneurial folks scattered to these regions creating a rich legacy. From that, Pittsburgh is home to magnificent museums and an eclectic culture. More obvious, Pittsburgh hosts a set of Universities, yielding generations of thinkers. The challenge that Pittsburgh faces is that the selfsame legacy created a mental model of how business works. That mental model expects capital-intensive businesses with a quick path to profitability, while the web presents us with lean startups, quick iterations, and a series of opportunities to learn. Too many early entrepreneurs, after having their learnings dubbed “failures”, leave for greener pastures and build their networks in California or New York. Without local leadership, recent graduates follow, leaving the local startup scene fallow. For a long time Pittsburgh couldn’t figure out how to enable successful local businesses to attract capital, mentor new companies, and for entrepreneurs with experience under their belts (but no success) to continue to grow their local networks. We’re currently at a tipping point. Startups are sticking around Pittsburgh instead of exiting for the coast. Some entrepreneurs are starting their second company in Pittsburgh while several notable examples bridge the local market for talent to remote markets for talent. Our startup community is fragmented with pieces near the Universities, others near AlphaLab, and yet others distributed through sparsely populated areas created by well-meaning government incentives. And yet, these pieces do compose a thriving whole. Pittsburgh, an early home to the AlphaLab incubator, is expecting a number of new hardware incubators, has seen new co-working spaces springing up, and is starting to retain a caste of experienced entrepreneurs. Much like how Pittsburgh once attracted the cream of the crop with its natural resources, we’re seeing a renaissance in technology and investments. The climate is right for Pittsburgh to propagate a series of successfully funded startups. What is apparent is a sudden explosion of new incubators, spaces, and entrepreneurs, the change has been gradual and the opportunity remains vast.